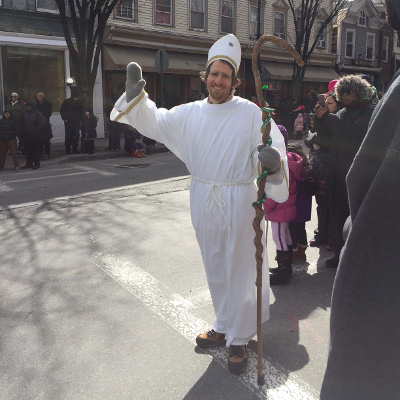 Before getting to the topic at hand, both of us want to say what an honor and pleasure it is to have served as St. Patrick in Sleepy Hollow's Parade. We are working to improve the health and economy of Sleepy Hollow and Tarrytown by making our transportation system better. There's a small step the Parade Committee can take to help on this front. Route 13 of the County-run Bee-Line Bus system carries 1.2 million riders each year between Ossining, Sleepy Hollow, Tarrytown, White Plains and Port Chester. Various street fairs and parades overlap with the bus' route, the St. Patrick's Parade among them. During most events, buses can use Pocantico St as a bypass. This means people can still get to and from the Tarrytown train station and both of our downtowns. The St. Patrick's Parade grandstand has been set up in Pocantico St. That results in buses being rerouted up around the Tarrytown Lakes, stranding people who get on in, or are heading to, our downtowns and train station. Considering the Committee's shared love of the community, it will be wise to set up the grandstand in Washington St, one block east. Just like at Pocantico St, it will fit in Washington St, on the north side of Beekman Ave. This small adjustment means Pocantico St is available for buses, making a huge difference for everyone expecting to get where they're going. If there are any questions or need for clarification, we will be glad to converse via email, over the phone or in person. Please keep us updated regarding the Committee's deliberations. Either way, we need to coordinate with the Village and the County so they can communicate the appropriate bus service change information in a timely manner.